Pls check my previous blog for the deployment of the NSX 6.1.4 OVA and here we can see the configuration of the NSX Manager. Browse to the HTTPS IP address which we assigned during the OVA deployment and login using the user Admin and Password. We can see two entries , Lookup service and vCenter Server . 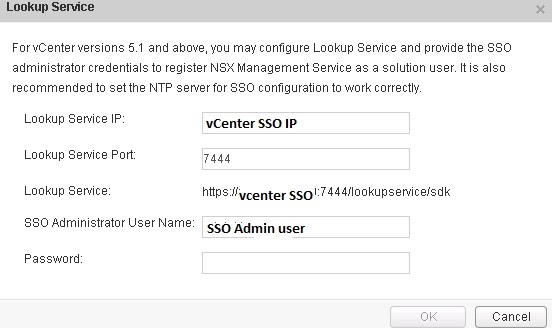 Lookup Service : For vCenter versions 5.1 and above, you may configure Lookup Service and provide the SSO administrator credentials to register NSX Management Service as a solution user. It is also recommended to set the NTP server for SSO configuration to work correctly. 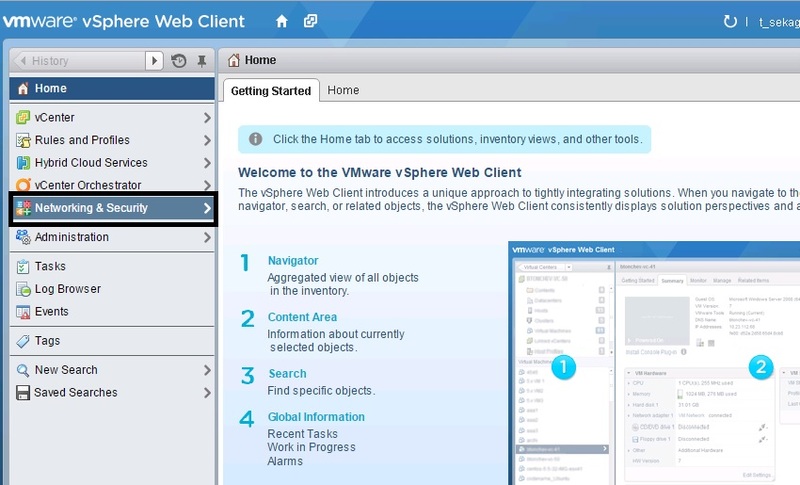 Connecting to a vCenter server enables NSX Management Service to display the VMware Infrastructure inventory. HTTPS port (443) needs to be opened for communication between NSX Management Service, ESX and VC. For a full list of ports required, see section ‘Client and User Access’ of Chapter ‘Preparing for Installation’ in the ‘NSX Installation and Upgrade Guide’. If your vCenter server is hosted by a vCenter Server Appliance, please ensure that appropriate CPU and memory reservation is given to this appliance VM. After successful configuration of vCenter on NSX Manager, you need to log out of any active client sessions on vSphere Web Client and log back in to enable NSX user interface components. Use the service account to connect the vCenter and the same account will be added to the NSX Manager. Once we connected to the VC , wait for few mins and login to the vCenter web client . Under Network & Security we can see the NSX Manager and its configuration. Click NSX Manager – Manage – Users and add the users or group to have NSX Manager Access and select appropriate role . Security Administrator : Users in this role can configure security compliance policies in addition to viewing the reporting and auditing information in the system. NSX Administrator : Users in this role can perform all tasks related to deployment and administration of this NSX Manager instance. Enterprise Administrator : Users in this role can perform all tasks related to deployment and configuration of NSX products and administration of this NSX Manager instance. This entry was posted in NSX 6.1.4, VMware and tagged NSX 6.1.4, NSX Manager. Bookmark the permalink.